Sugary sports drinks, fortified junk food, frozen veggies... why choosing these is making you unhealthy. Go fresh: Packaged food is always a lower substitute to fresh food, no matter how high the fortification. Keep rotis and paranthas and eat them on the go. They are still healthier than multi-grain biscuits and multi-grain instant noodles. Beware of sugar: Juices and sports drinks are the biggest culprits. To replenish after a good game or work out, drink water. Or Electrol. Whole vs juice: Whether it is vegetables or fruits, eating them whole is always better than having juice. The fibre and the phytonutrients (chemicals that occur in plants) are preserved and absorbed better in the body. Healthy snacks: Diet chiwda isn't healthier than a few nuts and can never be. Eat less, but eat the right quality of food. Diet namkeens have no nutritional value at all. And many are high in salt. Pack in at breakfast: Absorption of nutrients is highest in the morning. So, a nutrient-dense breakfast will curb the desire for junk and protect your body even if you let up. Follow the 80-20 rule: As long as you're eating fresh and whole 80% of the time, you can eat junk 20% of the time. So, add fresh veggies to instant soups and noodles and still enjoy the taste of junk. I eat healthy," says Akanksha Vaid, 38, Legal Head at a multi-product international company. "I always choose multi-grain biscuits and make sure my kids have fortified noodles, which are better," she adds. They don't forget to drink fresh tetra pack juice everyday with breakfast, chimes in her husband, Rishabh, 41, Head of Marketing at a sports products company. I wince, remembering the ad that has "fresh" and "tetra pack" placed side by side. Dichotomy? Nah. Successful marketing. The Vaids are just one example of thousands of professionals who believe that fortified packaged foods are healthy. Consumer and food product companies manufacturing them are laughing all the way to the bank, putting profits above health. So how do you make the right choices? In vegetables and fruits, fresh can never be compared to frozen or canned. Most of the water soluble B vitamins and phytonutrients are lost when they're canned or frozen. So, it is no use fooling yourself that you're sipping "healthy" vegetable soup from the packet or giving your child "healthy" instant noodles fortified with vegetables and vitamins. While you could replace B vitamins, there is yet no pill to replace phytonutrients that protect you from free radical damage and disease. Most instant noodles are known to cause hallucinations and brain damage in children under the age of eight years, while packaged foods can trigger asthma and allergies in children and adults due to the preservatives and additives put in. 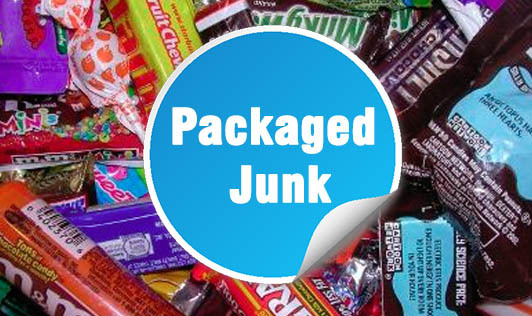 So, no matter how fortified junk food is, it's still bad. Reaching for multi-grain breads and biscuits as opposed to rotis means loading the body with additives, colouring agents and white flour. Whatever label a food company puts on its product, the two harmful ingredients-refined wheat flour (read: maida) and hydrogenated vegetable oil (read: transfats)-never go away. So, the simple rule while keeping convenience in mind is: go fresh. (See box: How To Balance Convenience & Nutrition). The Vaids are also sports enthusiasts. While the husband plays 18 holes every week on the golf course, the wife sweats it out on the tennis court. And after the game? A few large gulps of a sports drink to "replenish". Most instant noodles are known to cause hallucinations and brain damage in children under the age of eight years. "Children and parents associate these drinks with a healthy lifestyle despite their increased sugar content and lack of nutritional value," says Nalini Ranjit, Ph.D., Principal Investigator and Assistant Professor of Behavioural Sciences at the University of Texas School of Public Health, in her research on sports drinks. The research was conducted at The Michael & Susan Dell Center for Healthy Living at The University of Texas Health Science Center, Houston (UT Health) and was published in the October 2010 issue of Pediatrics. Researchers examined the association between sugar-sweetened beverage consumption, unhealthy and healthy foods consumption and physical activity levels of 8th and 11th grade students. They found that flavoured or sports beverage drink consumption increased with levels of healthy food consumption and physical activity when compared to high soda consumption, which was associated with lower levels of these healthy behaviours. "Sports drinks have been successfully marketed as beverages consistent with a healthy lifestyle, which has set them apart from sodas," said Ranjit, adding, "However, they have minimal fruit juice and contain unnecessary calories." Study results suggest there is a popular misperception of flavoured and sports beverages being consistent with a healthy lifestyle, despite their sugary content. So, what mostly gets replenished is the weight you're trying to lose. Nutritionists at UT Health also caution that children should have no more than one glass of fruit juice, even 100% fruit juice a day, because of the high calories. Sports drinks should be reserved only for extreme exercise. Otherwise, drink water to replenish lost fluids, and whole fruit is a better nutritional choice than fruit juice. Reaching for a handful of nuts is any day better than that multi-grain, high-fibre biscuit, unless you have a digestive disorder. And while replacing "diet" namkeens with the real fat-laden ones is definitely reducing your calories, it's not doing much for packing in nutrition to your stressed-out body. So, a handful of peanuts, five or six almonds, two or three walnuts and some pistachios are way better choices as individual snack ideas for that antioxidant plus good fat combination. And, if you're still in doubt, try it for a week. Your skin and hair will show you the difference.